Yes, polished game & cool music. Thanks for sharing! … umm, when you’re 300 m from the city limit, how do you get past the giant spiky wheels?? I mean the place after the conveyor belt at the start? Oh boy!! I found a way, but is it meant to be that finger-knotting? Go to the leftmost place of the platform (watch out for the spike from above. Wait for the spike to retreat, then run. Keep your finger on the right arrow and when you get to the spring, press up in addition. Keep pressing both keys! Once you’re past the the obstacle, change from right to left. That should land you in the safe area. jumping first, THEN using flow. how do you get that one realy hard flair on level 19 to finish getting all the uniplayer flairs… i got them all there is just the one in the very bottom corner i canot get? are you talking about the sign that is under the level? 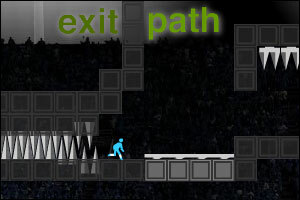 where is the warning sign on the last level, the exit screen? Really, REALLY close to the entrance. THE FREEDOM IS A LIE!!! A LIE I TELL YOU!!!!!!! Posted on Friday, May 28th, 2010. Follow any responses through the RSS 2.0 feed.